The standard finishes for Stainless Steel are indicated by a numbering system established by the stainless steel material producers. The finishing requirements, methods and resulting appearances of the stainless steel vary throughout the specifying system. Below we have outlined the standard finishes and the expected aestetics of the finished stainless steel. While our list outlines the stainless steel finishes it should not be considered a comprehensive listing and different grades as well as different thicknesses of Stainless Steel will result with difference looks under the same designated stainless steel finish. In the production of Stainless Steel (in bar or rolled stock) the material is supplied in an annealed or fully softened state. The production process for stainless steel is performed at high temperature. If the stainless steel production process is not controlled, it will result in a build up on the surface of the material called scaling. A pickling process (incorporating acids) is used to remove the scaling. Processing - Hot Rolled Annealed. Appearance - This stainless steel finish is not useful on products for general use. By hot rolling the plate and then annealing a resulting black scale finish is achieved. No pickling or passivating processes are used to remove the scale. This finish will also result in a limited or non corrosion resistent stainless steel material. Appearance - A dull look with a slightly rough surface. Common Use - This stainless steel finish is most suitable for industrial applications. Appearance - A Matt finish that is uniformily dull throughout the surface of the stainless steel. Common Use - This finish is used on metal parts for industrial applications. It is also excellent for drawn stainless steel applications because the surface of the material retains the lubricants used in the drawing process. Processing - Cold Rolled Annealed, Pickled, Passivated, Light Finish, Polish Rolled. Common Use - Because this stainless steel finish is the most common finish produced and called for on sheet material it is most commonly used in deep drawing operations. 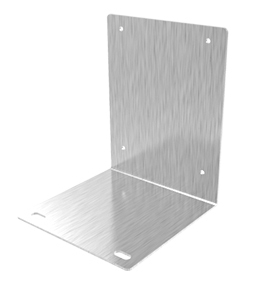 Common Use - Good finish when additional finishing is required for a finer stainless steel finish after forming. Appearance - Uniform direction brushed look, not highly reflective. Common Use - This is a good general purpose finish. 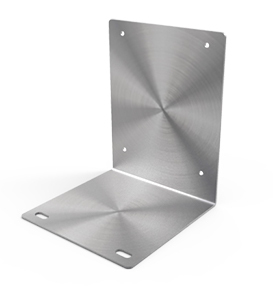 This stainless finish is often used on metal parts that will be in a service environment such as restaurant equipment. Appearance - Blemish free, clear image reflection, true mirror finish.